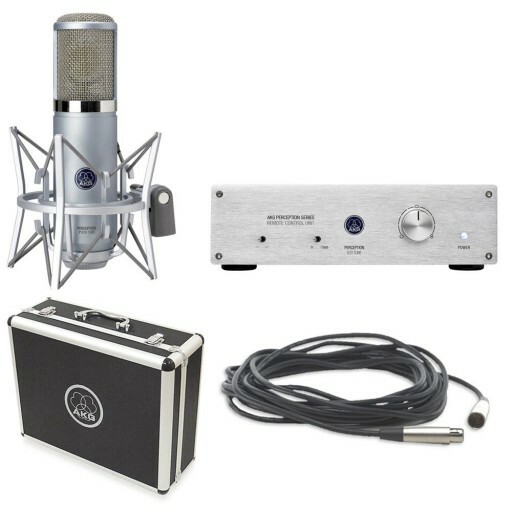 The AKG Perception 820 Tube condenser microphone makes quality tube mic performance affordable! This addition tothe popular Perception line gives you the rich sound only a real tube condenser can offer, while you control its stunning array of nine different pickup patterns (plus its low-cut filter and 20dB attenuation pad) from a very easy-to-use remote. The Perception 820 Tube uses a 1" dual capsule design to give you a very dimensional and smooth sound. Though this Perception flagship model excels on vocals, it's built to take the high SPLs you need to make the Perception 820 Tube a real studio workhorse. In 2005 AKG has launched the very first Perception models — a completely new series of microphones showing legendary AKG Sound & Quality at an outstanding price level. The Perception 820 Tube delivers real tube sound quality, raising the bar in its class of affordable tube microphones. This mic delivers real tube sound quality thanks to the dual one-inch large diaphragm capsule and the sophisticated ECC 83 dual-triode circuitry. You can't beat a real-tube design for classic sound and smoothness. Put the Perception 820 Tube on a vocalist and you'll know what you've been missing; put it on an instrument and you'll love the natural sound you get. The Perception 820 Tube includes an elegant remote control unit that allows you to select from nine different pickup patterns; it also controls the switchable bass-cut filter and the attenuation pad. Moreover, a ground lift switch prevents unwanted hum if necessary. This kind of versatility makes the Perception 820 Tube an ideal addition to your mic locker.